On the Menu: The Vegetarian Grill is calling! Summer took its sweet ol’ time getting here this year. June in Seattle was still “colder than Siberia!” The summer grilling season is in full swing now, and thus the time has come for vegan picnic events and community Vegfests! We are blessed to have an active fan base, people involved in compassionate gatherings and educational events for vegetarian food and living. We donate to events when invited, and hope that our tasty sausages make a point in case. Meat does not have to be made from animals! 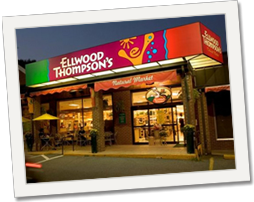 Ellwood Thompsons’ Natural M arket in Richmond, VA has been a customer of Field Roasts’ for about a year now, and since the beginning they have grown to be a favorite of ours on the East Coast. Their people are super nic e and down to earth. They serve our deli slices in their deli and sell the whole retail line of sausages, deli slices, and Celebration Roast in the dairy section year round. They are annually involved in the little VegFest in Richmond, and this year asked us to partner up with them for a sausage grilling booth. We sent signs, sausages and some love to them and it looks like they had a great time! It is really nice to feel like we are well taken care of on the shelf and at such an event. I hear that Richmond, VA isn’t the most veggiest place on the map, but their pocket of people is growing J Thanks to Mandy for making it happen and sending the photos! The Farm Sanctuaries, in both NY & California held their annual 4th of July Pignics, and this year drew over 200 people to their farms. You can see all of their extraordinary work on their website (it is quite extraordinary indeed!) Thanks to Liz and Carolyn for getting us involved! From the 25-27th of July, Post Punk Kitchen is hosting an event called Vegan the Gathering II: the Veganing that lasts three days, and involves “food, camping and port a potties” at the Willamette Mission State Park. This Saturday I met up with Isa Chandra, author and chef of Vegan with a Vengeance, Vegan Cupcakes take over the World (so fantastically yummy! ), and Veganomicon co-written by Terry Hope Romero, to exchange Field Roast for vegan cookbooks at the Food Fight Grocery in Portland. The sausages will feed the event goers for the weekend. Isa gave us a stack of books! 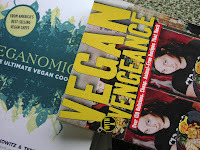 Including 3 copies of the newest Veganomicon! Thanks again to Isa and the rest of the Post Punk folks, we will put them to good use! !